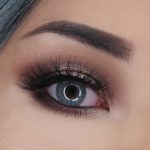 The products of the eos Holiday Collection 2017 that I’ve received are the Lip Balms in Peppermint Cream and Peppermint Mocha, the Holiday Trio Set and the Merry Berry Trio. There’s one other set in the collection that I don’t own, which is the Vanilla Trio, containing the same products as the Merry Berry Trio, only with different scents/flavors. 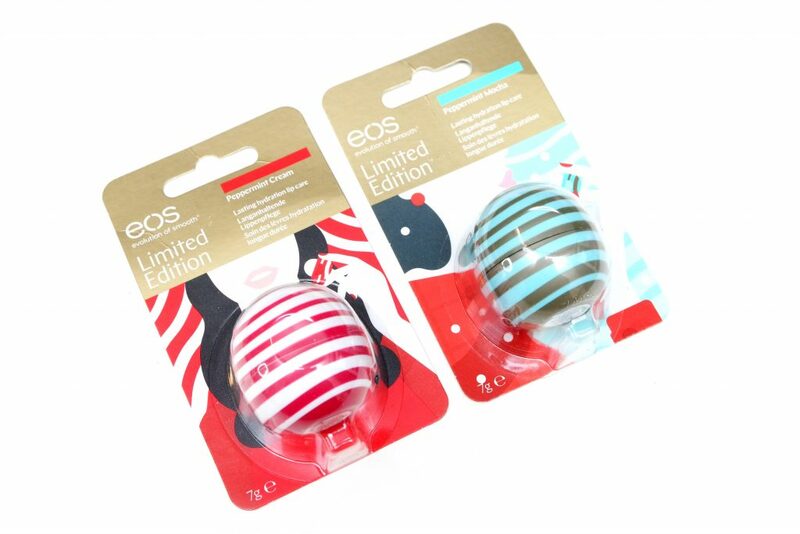 The eos Lip Balms in Peppermint Cream and Peppermint Mocha (€5,99 Euro/7 gr each) are Limited Edition scents/flavors with a festive packaging that has red/white and blue/brown stripes. 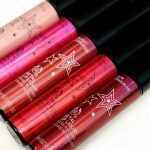 The Gluten-free and Hypoallergenic formula contains Shea and Cocoa Butter, as well as other ingredients for deep hydration and softer lips. 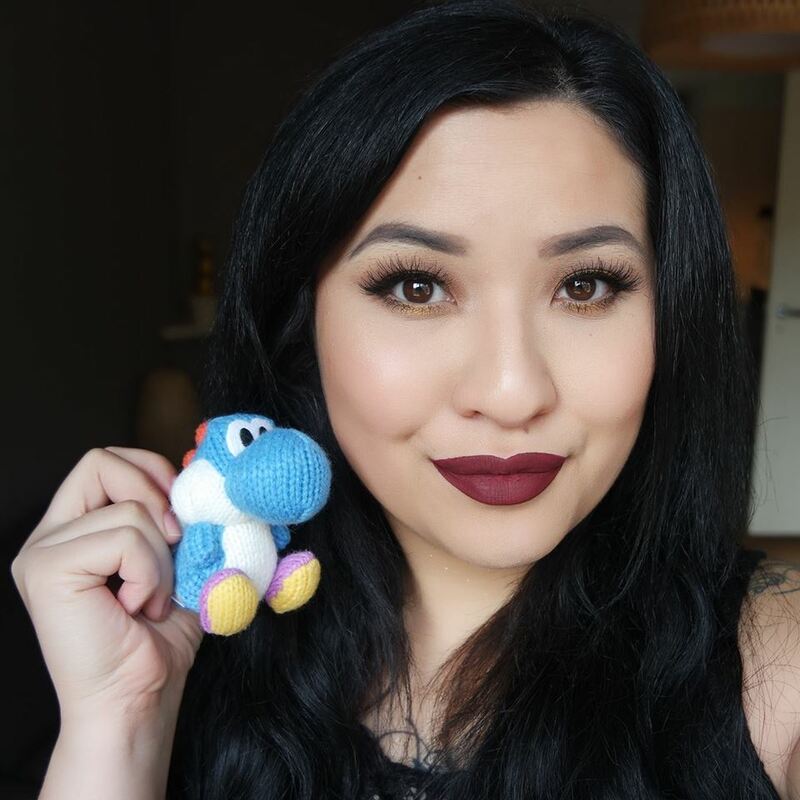 One of my favorite lip balms ever is the eos Lip Balm in Sweet Mint (review here), which is similar to both of these scents/flavors but has a different formula. If you like a minty scent and feeling on your lips like I do, you will definitely like these lip balms. 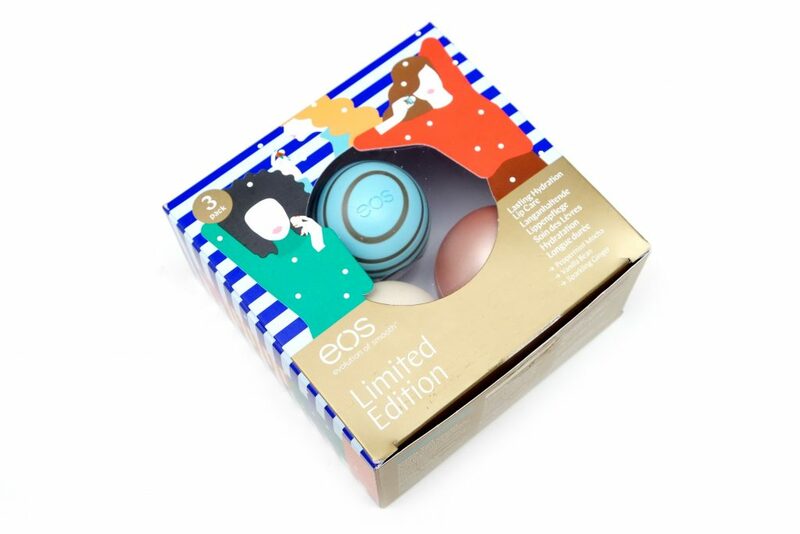 The eos Holiday Trio Set (€14,99 Euro/3×7 gr) contains three Lip Balms with the scents/flavors Peppermint Mocha, Sparkling Ginger and Vanilla Bean. 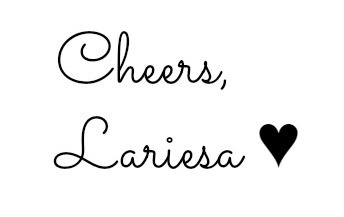 The last two scents/flavors are not available separately (in The Netherlands). These scents/flavors are completely different to one another, perfect to switch depending what mood you’re in. What you can also do is share with others or divide these for Surprise and shoe gifts for Sinterklaas, three eos Lip Balms costs about ~ €18 Euro so you save up €3 Euro (aka €5 Euro per lip balm instead of €6 Euro). eos is known for their Lip Balms, but did you know that the brand also offers other products? The Merry Berry Trio (€14,99 Euro) contains the eos Lip Balm in Honey Apple, the Berry Blossom Hand Lotion and the Berry Blossom Body Lotion. The Hand and Body Lotion are both available individually, but the Lip Balm is exclusive to this set (in The Netherlands). Honey Apple smells so good! It smells sweet and juicy, it kind of reminds me of a lollipop. 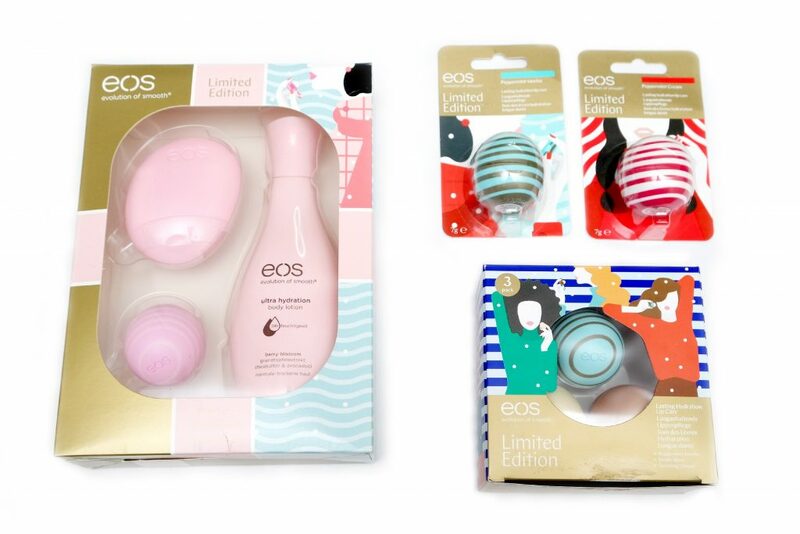 This set is great to try out a selection of different products that eos offers. This set will save you €5 Euro in comparison to buying everything separately. I really like that eos offers several products that are exclusive to some of the sets. It makes everything more interesting, plus the sets have a good value. The packaging also looks nice and festive, with the Merry Berry Trio looking more “neutral” so you can also buy this set now and use it as a gift for another occasion. 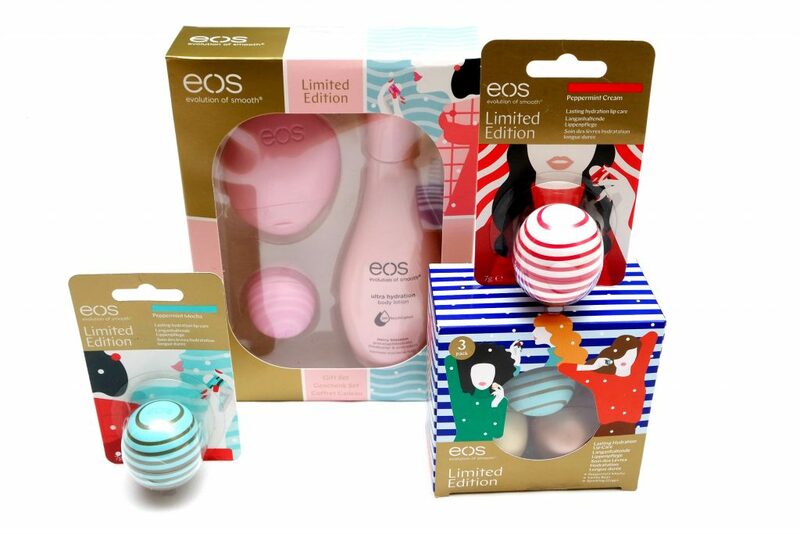 The Limited Edition eos Holiday Collection 2017 is available at Douglas.nl and Douglas stores. 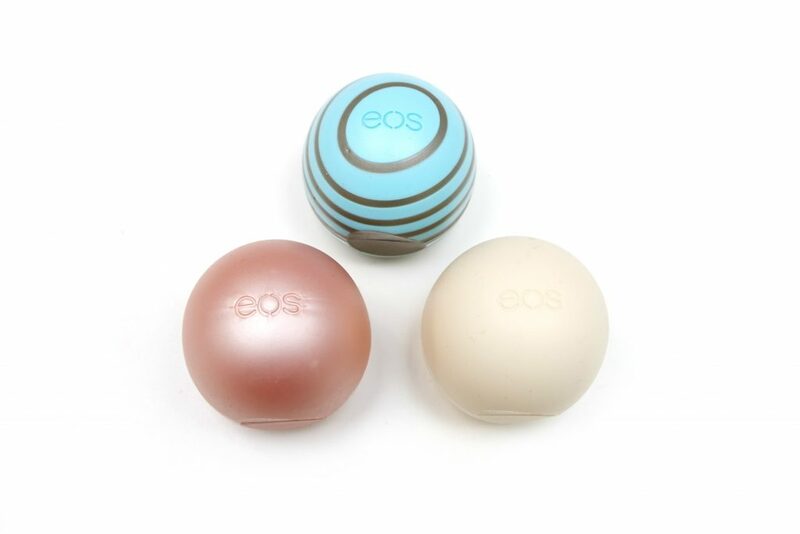 Which scent/flavor eos lip balm do you find most interesting? Wat een heerlijke collectie van producten zeg!